My boys (now 12 years old) used to do yoga with me when they were little. It always morphed into some kind of karate/yoga combo. But I was ok with that. It was fun and when it comes to kids and yoga, it’s best to go with the flow! My friend Karen wants to start a morning routine with her two young kids. It’s a great idea that could really help get your little ones focused and put them in a good frame of mind for school. So today I would like to share some tips on doing yoga with kids. However, doing yoga with kids is not the same as doing it with adults! Here are a few suggestions. Have a plan but be ready to change it up. You can plan a short routine but gauge how your kids are feeling. If they just can’t sit still, add in some energetic, flowing movements. Try Yoga cards. They’re fun and your kids can get involved in creating the practice. Let them choose a few and do the poses. The decks usually explain how to do the poses and may suggest a question of two to think about. Leave room for self-expression and creativity. 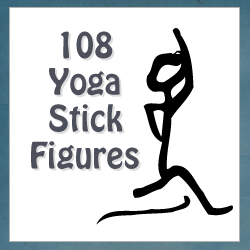 Let kids suggest poses, make up names or modify things. My boys created the “Canadian Warrior.” It’s a version of Warrior 1 (Virabhadrasana 1) with the addition of a karate chop motion! Offer specific, concrete, positive feedback. For example, “Wow your back leg is so straight and strong in that warrior pose. Don’t get too picky about alignment. If your child is safe, moving and having fun, count that as a win! Leave your kids feeling positive. Incorporate a short, simple meditation. Have your kids sit cross-legged. Then have them put their hands in a mudra with their index fingers and thumbs touching. Ask them to close their eyes. Get them to count by moving their thumbs to each finger, one at a time – 1, 2, 3, 4. Repeat this a couple of times. Keep instructions brief and simple! Don’t overcomplicate with words and be sure to demonstrate. Here’s a short sequence to try with your little ones. You can suggest an affirmation if you think this would suit them. I’ve tried to suggest some simple wording but don’t overthink it. Following along with your actions will likely be the most instructive thing. Breathe in and lift your arms over your head. Breathe out and fold forward. Breathe in and lift all the way up again, stretching your arms to the sky. Bring your arms to your side. Breathe in and stretch up tall. Breathe out and bend to one side. Breathe in and come back up. Breathe out and bend to the other side. Step one foot back. Bend your front knee. Take a big breath in and lift up your arms. Switch feet. Stand very tall. Put your foot on your ankle or above your knee and balance. Then switch feet. Come onto your hands and knees. Breathe in and look up. Breathe out and curl your back up to the sky. Lie on your back and bring your knees into your bell. Hold onto your feet. Open your knees up wide. Rock side to side. 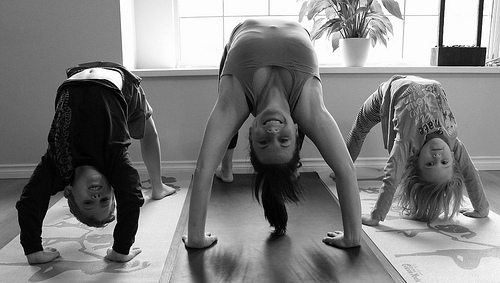 Do you teach kids classes or practice yoga with your kids? I would love to hear your tips! Just leave a comment below. Liked this post? Subscribe to our newsletter get lots more! Want to energize your yoga practice? Join me each week for yoga tips, sequences & inspiration. I look forward to sharing my best with you. Thoughts or questions? I would love to hear from you! Hi, I'm Charlotte Bradley. I love yoga. I write a weekly newsletter all about it. I'm also on Twitter.